Dr Alistair Miller graduated from Guys Hospital in 1985. Dr Miller first practised in Dulwich, London and also in Nuneaton with his father who was also a dental surgeon. In 1999 he moved into the Cheltenham area with his family and became Co-owner of the Practice in Bishops Cleeve. He is registered with the General Dental Council, is a member of the British Dental Association, Gloucestershire Independent Dentists and a member of Denplan. When not at work Alistair is a keen cyclist and enjoys sailing. Dr Faiz Isaacs graduated from University of Western Cape in 1992. After practicing in South Africa for 9 years and later in Bristol he joined the practice as co-owner with Dr Alistair Miller in March 2008. Dr Isaacs has an additional interest in occlusion & TMJ (how the jaws and teeth relate to one another). In his spare time Faiz enjoys running, hill climbing and water sports. Dr Emma Brazier graduated from Birmingham School of Dentistry in 2003, and joined Miller and Isaacs in 2010. She enjoys all aspects of Family Dentistry and welcomes anyone with a fear of the Dentist. She aims to make your visit as comfortable as possible. Emma is registered with the General Dental Council and is a member of Gloucestershire Independent Dentists and Denplan. In her spare time Emma enjoys yoga and weekend adventures in her campervan with her husband and daughters. 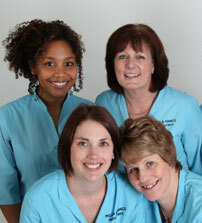 We cannot stress enough the importance of your oral hygiene and therefore Rebecca is an important member of our team. Rebecca qualified as a dental hygienist in 1991 at Birmingham School of Dental Hygiene and has also won the prize of Dental Hygienist of the year. Rebecca joined Miller and Isaacs in 1993 and is also fully qualified to administer local anaesthetic, temporary dressings and the re-cementing of crowns. In 2013 Rebecca attended Dr Wyman Chan's tooth whitening course at his Smile Studio London and has since carried out many successful courses of tooth whitening for our patients. 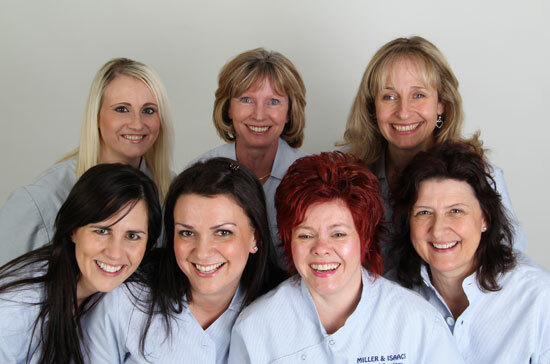 All of our nurses are fully qualified and are registered with the General Dental Council and the Dental Nurses Standards and Training Advisory Board. All of our nurses undertake continuous postgraduate education on Gloucestershire Independent Dentists course programme. Our care co-ordinators are important members of our team and will be you first point of contact with us. They will be able to answer a number of queries along with helping you to schedule convenient appointments with your dentist or hygienist. Please feel free to contact us by either telephone or email.